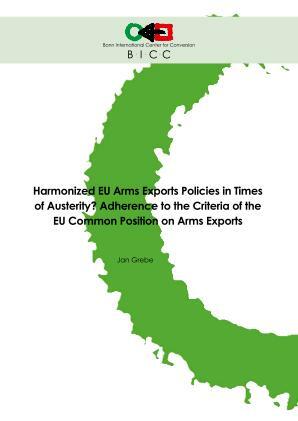 Harmonized EU Arms Exports Policies in Times of Austerity? Adherence to the Criteria of the EU Common Position on Arms Exports. The study analyzes the current trends on the international arms market and the role EU Member States play as well as the adherence to the Criteria of the EU Common Position. It also takes a closer look at the effects of austerity measures on the European defense industry and the shift towards non-European markets. Against the background of a changing environment after the end of cold war, EU Member States agreed on the introduction of the EU Code of Conduct and later the EU Common Position on Arms Exports to harmonize their arms exports. The objective of high common standards for arms exports has led to a better harmonization among EU Member States. EU Member States apply the Criteria of the EU Common Position differently over time and use a number of Criteria, for example, Criteria two and seven, more often than others. Yet, there continue to be differences in the implementation as well as the interpretation of the Criteria of the EU Common Position. Despite some efforts in the last fifteen years, there continue to be some problems to achieve high common standards for arms exports. The level of reporting and transparency needs to be improved and national parliaments need to ensure a timely publication of arms exports data. Consideration should be given to introduce a consultation mechanism for post-embargo countries as well as countries of concern. A better review of the interpretation and application of the Criteria of the EU Common Position would improve the level of harmonization among EU Member States. The role of the European and national parliaments need to be strengthened and the European parliament could act as a facilitator to stimulate the discussion among national parliaments.